Learn Spanish at best Foreign language centre in Coimbatore for Spanish Language Courses, Spoken Spanish Classes & DELE Exam preparation. Learn Spanish at best Foreign language centre in Coimbatore.Spanish Classes Coimbatore: Spoken Spanish, Spanish Diploma,Spanish Certificate Courses, DELE Certificate Courses, Spanish Coaching Classes for DELF Exam Preparation, “How to Speak Spanish?” Sessions. Want to learn Spanish? Having only a limited time ? Do you have an erratic work schedule ? Or , do you require one on one sessions? Well, Lingua World is the place for you. We keep in mind the specific needs of the candidates. However, the customized Spanish courses have all the attributes of the professional language courses. The Spanish Diploma Courses correspond to the levels of the Common European Framework of Reference for Languages . As a result our students are able to compete very well in the DELE Examinations. Our DELE preparation courses are very useful for people leaving for Spain and other Spanish speaking countries. who have less time in hand. who have erratic work schedules. have specific learning requests. require one on one sessions. The course of Spanish language follows a structured method which enable the learners to learn and speak Spanish very well. Smart Learning Methods. Audio Video Sessions. Multimedia Support. One on one Sessions. The course of Spanish language follows a structured method .This enables the learners to learn to speak Spanish in a very short time. We also prepare students for a short duration courses in A1 and A1 Spanish Exams.The one on one courses enable the participants to perform excellently well in the Dele Exams in all areas : Reading, Writing, Listening and Speaking. The intensive ” How to Speak Spanish ?” Sessions are very helpful in making participants very fluent in Spanish in a very short period. A1 & A2 EXAMS (START DEUTSCH) We give the best of training for students leaving for Germany for higher studies and jobs. 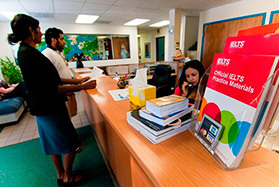 Prepare for and take the IELTS at Bridge, an official testing center. Classes, Crash courses and training at the best foreign language training institute. Lingua World is an excellent place for those who are looking forward to learn foreign languages. I have found this institution very supportive toward the students in grasping his/her language of choice. 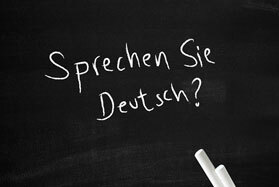 Our instructor is a true professional and have great knowledge about German Language, which is my language of choice, he handled me with patience and care so I have found doing this course easier now. I am lucky that I have selected Lingua World to do my German Language Course. Lingua World offers students a conducive environment for learning new languages. I joined the German course. The training materials provided were excellent. Professor Mani has expertise in many languages and provides proper guidance and with his style of teaching it is easy to grasp the nuances of learning a new language. Not only the grammar but interactions with him and other students helps improve the spoken language skills. The timings are very flexible which is an added advantage. One of the best institutes for learning German language. In addition it has flexible timings, friendly companions which surely deserves a mention here. The professor has more than 30 years teaching experience in teaching foreign languages like German, French, Chinese etc. I will recommend all the guys who are looking to complete the course in short time. Finally I would rate this center 5.0/5.0, so this would be the best choice for you. It is fully flexible coaching center with individualized training. I am doing A1 curse and I am planning to do A2 also.I am working in a private company here in Coimbatore and I am planning to pursue my higher studies in Germany. For that I have to prepare for A1 & A2 Deutsch courses and I have only time in the week ends. I cannot go to classes after work in week days and in this situation, I came to know about Lingua world for German courses. Lingua World helps you to learn a new language effectively by utilizing various tools of learning in a very short span of time. I did a French language course here and I have been able to cope up with the language far more comfortably. I would like to give the credits to the Sir for having helped me to learn the language so fast. It was an amazing experience to do my German class in Lingua World. I have done A1 level in less than 75 hours and will fully flexible timings. Lingua World is the best choice for professionals and students who need flexible timings. The dedication of our teacher is really excellent and I am planning to do A2 training also here. I am learning Swedish at Lingua world. The learning process is contemporary with video and audio lessons. I am able to communicate in Swedish in a month. I would recommend Lingua world for beginners who are interested in learning new language like German, French and Scandinavian languages. HAPPY LEARNING. I have been learning German level A1 for almost more than a month now and would be appearing for the exam in a week`s time. I can confidently say that the approach with which the language taught here is brilliant. Individual care is given to all students who come here and highly recommended for anyone who aspires to go to Germany or is interested to learn German language. I have done A1 level German course in Lingua World and within one month we have been trained in such a manner that I can score very good marks in exam now. I am now able to read, understand and speak the language fairly well. Thanks to the dedicated and committed training of Mr Vaikundamoni. It is really a great experience being a student of Mr Moni and I am sure that this is the best center for learning German in Coimbatore. The teaching is very good in Lingua World and the materials given are excellent. The teacher has been very considerate and caring and we were given individual guidance and attention. I came to Lingua World after trying other canters and here the atmosphere is awesome and I will never forget my learning experience here. This is the best institute for leaning German..
Its been a wonderful experience so far learning German with Professor Vaikundamani . The biggest advantage of the course is the flexibility in Timing, In my situation i only had 10 days left for the exam and in the crunch situation he sat with me throughout all the 10 days close to 9-10 hours per day and made me prepare for the examI am going to continue my A2 preparation with Lingua world in coming Month . Cheers , All the best!! One of my friends who has studied German A2 level in Lingua World, suggested me to study German A1 in this centre. As I visited Lingua World, Prof. Vaikonda Moni advised me that he would train me and complete the A1 level within 20 days. Of course he is true to his words, He taught me and gave me intensive training so that I could write the A1 exam having excellent knowledge in Grammar Basics in German. Now I feel much confident in starting to speak German. The best institute for languages. The best institute for languages. One can learn any language within a very short span of time. Lingua World in my opinion is one of the best language training institute in Coimbatore. I had the opportunity of A1 level German course, the experience of learning German here was really good. I had a pleasant experience with Mr. Vaikundamoni Sir. His experience in Language teaching is really amazing. We had flexible timings. The approach of teaching language was good. This is the best place for learning German and other languages. It is a wonderful place to learn German.I have done my A1 and A2 Level German Course here and scored well in the Goethe Exam . If you want to get the best of training for German this is the place. Apart from that the person who is handling the German classes here takes personal care of each and every student. In my view it is simply superb and people must use it. The location is easily accessible. The best feature is the fact that the timings are flexible and it’s available every day of the week. The teacher has a thorough grasp on all the languages being taught here, especially German. Multimedia teaching provides extra advantage for the students without any doubt to master any language within a short span of time. The location is also pretty close to Gandhipuram and is easily accessible. All in all, an excellent experience. One of the best in Coimbatore for sure. We are taught from the very basic. 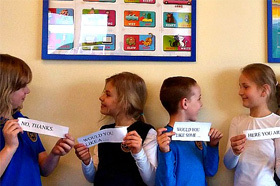 Lingua World is the best learning institute for languages like French, German and Dutch. Class timings are very flexible and individual attention is given to each one. The teachers are very friendly and the atmosphere is very good. I am learning French here as I am planning to go abroad. The learning materials are really excellent and the teaching method is very good. One need not have any knowledge of the language to start the learning here. We are taught from the very basic. I will recommend all people like me to do the course here if you are interested in learning any foreign language. I really love this place and this is a very good start point if you are looking to learn German. More importantly the timings are flexible and Mr. Mani makes us think to the core to overcome the small language hurdles that we face initially. I am sure that everyone who wants to learn a foreign language should give a try here. Also it is the best place in Coimbatore for working professionals especially in corporate sector. Online accessibility to the Lingua World blog is an added advantage compared to others.The centre is located in the heart of the city and bus services are available to the centre with just 10 minutes walk from the nearest bus stop. Fees are very nominal compared to other centers. Professor has vast knowledge of different languages and can identify the student's progress in a few days. His friendliness and approachability is the key to learning the languages fast. Individual attention is given to every student. Professor takes enough effort in bringing out the best from a student. My experience with Lingua world is just amazing. I have been learning German at Lingua world since three months. I am a dentist by profession & I am from Palakkad. I am at the verge of completing my first level A1 of German language. I have improved a lot and gained confidence as days are passing. The coaching is excellent and it has helped me to improve my German vocabulary. I am able to grasp German quickly now. The constant training, excellent work books & study materials have helped to me to pick up German faster. Had the opportunity to learn German at this great place. The strong basics helped me understand the structure of the language. I did my A1 and A2 here. It helped me a lot to improve my language when I went to Germany. Now I'm done with my masters and also got a job. Thanks to Mr.Mani and his diligent teaching. Also, sehr empfehlenswert und auf jedenfall sehr hilfreich wenn man sich die Mühe gibt. 114A, Kaleeswaranagar Corner, (Behind Hotel Alankar) Ram Nagar Area Coimbatore - 641009.